Chicago is up to its usual weather tricks. Yesterday, it was in the high sixties, today it is supposedly going to snow. I went outside a few minutes ago with Stewart and there is a decided chill to the air. My biggest issue is the plants that I have that I am trying to get outside to transition them and avoid the sunburn that I often provide them with. Luckily, some of them are on a cart in the garage and I can easily move them. I have some in a simple greenhouse and with a thermometer in there, I can see what the temperature happens to be. The pond is doing well, I have still not removed the netting since I know that the landscapers will soon be by for a spring cleaning and they use their blowers. I will remove the netting after that. The goldfish are doing well. I hope to get a few koi to add to the pond as well. I have purchased barley to help clear the pond water. They pack it in a six inch netting packing that floats and sweetens and clears the water naturally. I have also bought some floating plants. The rhubarb is growing as are the chives. 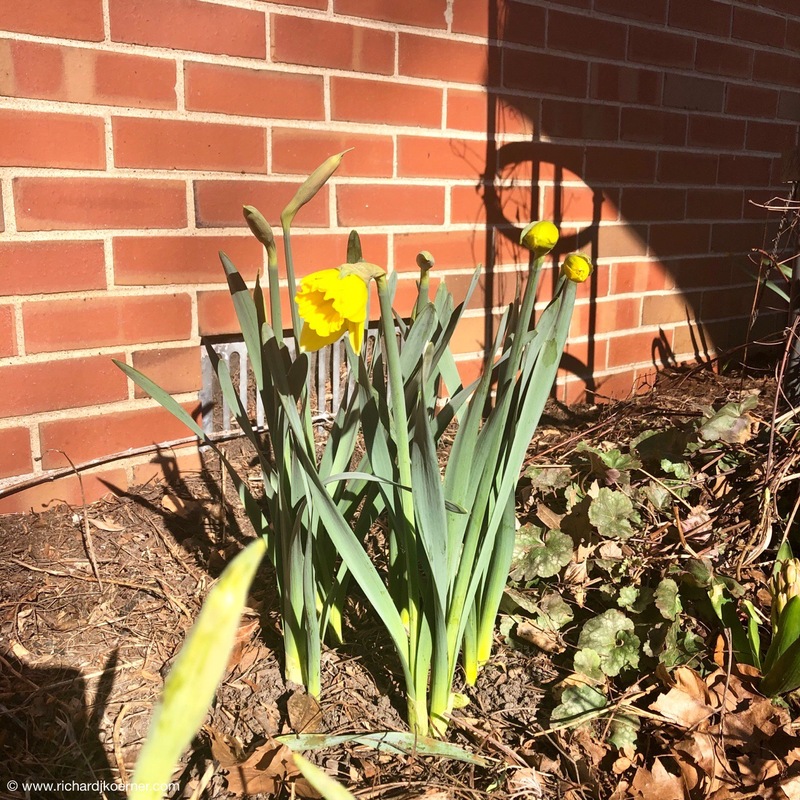 The daffodils started blooming yesterday. The grandkids totally enjoyed being able to go and grab one and carry it as they rode their vehicles. Yesterday, the little boy from across the street came over as he has been coveting the tractor I picked up on the sidewalk down the street. It has become a new favorite. Surprisingly, our youngest grandchild is really good at the Big Wheel, something the girls were less interested in. As Mary Kay puts it, we had one nice day, one day when we could put everything out. I even got the garage straightened out as the kids played. Next up is the forsythia. I hope it has a long bloom!